The British artillery support for the offensive was on a prodigious scale; planning and preparation was meticulous, although somewhat hectic at times. The Royal Regiment of Artillery had grown in size since the early days of the war, now boasting an impressive array of guns, howitzers and mortars. Ammunition production had also increased and was available on a scale that would have been unimaginable a mere six months earlier. With this growth in materiel, many new methods and tactics were being utilised for the first time. The experience gained and the lessons learnt throughout the coming months of battle would develop the artillery formula that would eventually pave the way to ultimate victory. However, in mid-1916 that victory was still a long way away. The preliminary bombardment was to be fired over five days, later extended to seven days due to inclement weather. The original five days designated as U Day, V Day, W Day, X Day, and Y Day with the additional two days named Y-1 Day and Y-2 Day. On U and V Days gunners were to register and cut German barbed wire, on the preceding W, X and Y Days the shells were to rain on enemy defences and strongpoints whilst wire-cutting continued. The two extra days, Y-1 and Y-2, were used wisely to finish cutting remaining uncut wire and to continue the pounding of the German trench defences. Counter battery fire would feature on every day; most of the attacking Corps dedicated one third of their heavy artillery to this task alone. The RFC and kite balloons would assist in observing and correcting targets at distant ranges. There would be checks and pauses to deceive the enemy, the idea was to convince the German defenders an infantry assault had begun, so that they would rush up the steep steps from their dugouts to man the parapet, only to be raked with shrapnel and shellfire. When these ruses no longer tricked the foe, smoke and/or gas would be released to persuade them that the real assault had, at last, begun. The programme for Z Day, the day of the infantry assault, was so arranged that the usual 80-minute morning bombardment would be fired for only 65-minutes. It was hoped that the enemy would be sufficiently used to the former, lengthier bombardment and remain in their dug outs whilst British infantry crossed No Man’s Land. Saturday 24 June was fixed for the opening of the great Allied bombardent and designated as ‘U’ Day. The primary task was registration of ‘wire-cutting’ field artillery batteries. However, this did not get off to a productive start. The morning was dull with low clouds and heavy rainstorms, being unfavourable for accurate artillery shooting, though as the day progressed conditions and visibility improved. During the morning Forward Observation Officers, looking out from their hidden posts on Maricourt Ridge and Hill 124, could survey very little. Adjusting fall of shot from a distance with inclement weather and limited visibility would be challenging. Where it was possible to view German wire from the first trench system, artillery FOOs moved closer. Even from these forward observation posts it was difficult to see German wire due to tall grass and weeds. In many instances it was only the top of wooden posts or knife-rests supporting barbed wire that could be observed through binoculars and telescopes. It was just as well many of the massed batteries of field artillery, immediately behind Maricourt Ridge, had registered their targets over previous weeks. The secondary task of the day, commencing late afternoon, was a concerted effort by the ‘Counter Artillery Group’ 29th HAG to destroy or disable German artillery batteries. For the time being heavy guns and howitzers of the two destruction ‘Heavy Artillery Groups’ 31st and 33rd HAG’s were to remain silent - their opportunity to join the fight would come later. The second day of the bombardment started on a better note with bright skies and warm weather. The artillery programme continued in earnest with divisional field artillery wire cutting for the second day. Results of the first day’s bombardment had been sketchy; the previous night’s patrols had reported damage to enemy wire, although in the main it was still a formidable obstacle. Better weather would bring improved observation, thus increasing the accuracy of the FOOs adjustments. Today the field artillery would be joined by the heavy ‘destruction’ artillery of XIII Corps and the French heavies of ‘Group de Menthon.’ It was to be a successful day for the heavy artillery groups. The months of planning and gathering of intelligence as to the enemy’s locations, strong points, machine-guns, artillery batteries, rear area billets and supply dumps was to pay off. 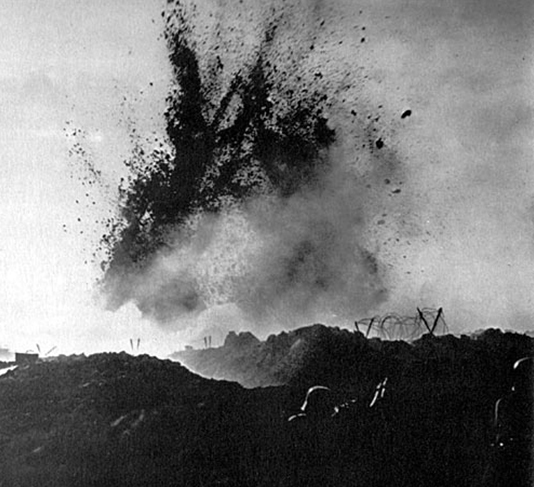 By the day’s end observers could see several of the enemy’s ammunition dumps at Longueval and Montauban blazing away with large explosions audible as the German ammunition exploded. On 26 June the weather became unsettled, bright intervals alternated with heavy showers and clouds were low for the greater part of the day. Along the entire Fourth Army front the phase of the artillery programme described as ‘destructive effect’ commenced, with concentrated shelling taking place from 9 - 10.20 am. During the remainder of the morning and early afternoon, gas was discharged in six locations further north along the Army front, although none was discharged on XIII Corps frontage. Corps artillery supported the gas attacks with heavy bombardments. 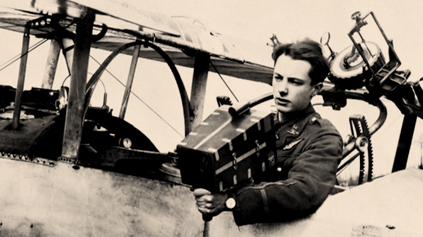 At 3 pm the bombardment was suspended to allow the Royal Flying Corps to photograph the area in order to obtain an exact record of the shelling so far. The aerial photography revealed how the heavy shells had fallen and gave an up to date image of the condition of the enemy wire entanglements. The results of the bombardment appeared to be satisfactory. Still, it was decided that the effort was to be doubled in intensity. During early morning the weather took a turn for the worse; at first light a dense mist lay thick on the ground followed by heavy showers. Although there were slight improvements later that day, low cloud and bad visibility seriously hindered X Day’s artillery programme. Particularly disrupted, with such reduced observation, were longer range counter battery shoots and target correction from RFC aircraft and kite balloon sections. 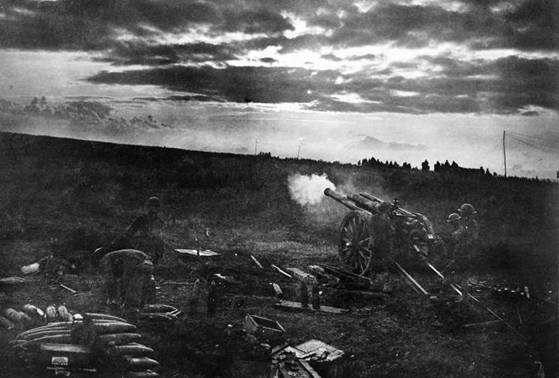 The adverse weather conditions helped the Germans greatly as their artillery, for a second day running, came out of hiding to fire at will with limited risk of compromising their positions. In retaliation XIII Corps’ heavy artillery doubled its rate of fire onto known or likely German artillery positions and defences. It was hoped the increased rate of fire would subdue German batteries. Despite long range shooting without observation and accurate corrections being identical to ‘stabbing in the dark,’ some lucky results were achieved. British observers reported at least one large explosion and fire from north of Montauban. For a second morning, dawn saw a thick mist with heavy rain showers and low cloud. The circumstances were not beneficial for the artillerymen who had hoped for improved weather conditions with clear observation. This was the final full day of the planned preliminary artillery programme. If they were to accomplish their mission of destroying German wire and defences, they would require accurate corrections from ground observation posts and from the air via Royal Flying Corps aircraft and balloons. Conditions for infantry manning trenches were more like winter, soldiers were wet and weary, trenches were thick with mud and movement was difficult. Many infantry battalions were scheduled to attack the following morning whilst some were due to be relieved by fresh battalions. Conditions were not conducive for either. Attacking across mud-covered terrain after a cold, wet night without rest would play into German hands. To relieve troops in the forward trenches would not only be problematic but also throw the plan into disarray. Many supporting battalions had moved forward during the early hours of the 28th and either manned new, but flooded assembly trenches, or camped in outdoor bivouacs. The luckier men had shelter in dugouts and cellars, but still conditions were miserable. The Z Day bombardment, especially the barrage in support of the infantry attack, relied on good observation in order to carry the assaulting troops to their final objectives. The weather outlook for the following morning’s attack placed the assault in jeopardy. High Command called for a conference to debate options. At 11 am, as a result of the continuing bad weather and by unanimous agreement between British and French High Command, Z Day was postponed for 48 hours. The revised plan called for the attack to commence on Saturday 1 July. News of the postponement was circulated as quickly as possible and in various ways. In some villages and troop billeting areas soldiers shouted out news of the postponement regardless of what ears might be listening. The two extra days were designated Y1 and Y2. The artillery programme for Y Day, a day devoted to destruction of defences, was to be repeated on the two extra days. The extension would require some economies of heavy gun and howitzer ammunition but the daily eighty-minute concentrated bombardment was not omitted and would remain at the same intensity. The bombardment programme was continued, aeroplanes observing for counter-battery work, and the ground in the German position seemed almost alive with the spurts of earth where the shells were bursting. Fires were seen in Martinpuich, Miraumont and Gommecourt and 57 batteries in action spotted. In the early morning of the 29th the enemy apparently became nervous and stood-to, firing machine guns and putting down barrages. He did so again when some smoke was emitted at 5.10 pm and a third time, when a little gas was released by a division. From the examination of prisoners it is apparent that our artillery fire has been most effective. Most of the dug-outs in the German front line have been blown in or blocked up. Even the deep dug-outs of a Battalion H.Q. were not proof against our big shells, as the Commanding Officer of a Battalion of the 62nd Regiment (Montauban) was wounded and two other officers killed in one. It is with great difficulty that rations have been brought up to the German front line. Several prisoners and deserters say they have not received food from the rear for three days that they have eaten their iron rations without orders and have suffered from the scarcity of water. The morale of the 109th Res. Regt., 62nd Regiment and the 99th Res. Regt. appears to be very bad. Overall, the report provides an impression that this situation existed along the entire Fourth Army front. However, the German soldiers interrogated had only served with RIR 109 who garrisoned the trenches about Mametz and east towards Montauban, IR 62 who held the area south of Montauban and 99th Res. Regt who held the Schwaben Redoubt and trenches opposite Thiepval Wood. By coincidence, all three areas were successfully attacked on Z Day with British infantry gaining access to the German positions. The intelligence summary is selective in not mentioning where British patrols or raids failed to enter German trenches. There were numerous failures along the front, more often than not in sectors where attacking troops met with disaster on Z Day. The summary gave an impression of German defence collapsing along the entire Army front but is based on a few narrow sectors. Apart from prisoner statements and patrol reports there was very little else to support the intelligence claim. Aerial photography had been impossible for the previous two days due to inclement weather conditions. It therefore appears intelligence staff at Fourth Army Headquarters were basing their assessment on a handful of interrogations and reports from successful raids that had, in the main, explored only the German first trench and no deeper. Another coincidence regarding the three sectors listed was their similar topography in that British FOOs achieved good ‘ground’ observation over their opponent’s first line defensive system which resulted in greater accuracy of the artillery. The final full day’s bombardment began as if it were now a normal occurrence. The weather remained dry in spite of some cloud, although an increase in wind on the previous day had helped in drying the ground. Increased wind speed hindered the work of RFC aircraft and kite balloons and affected the flight trajectory of artillery shells, making correction and adjustments challenging, especially on longer range shoots during counter battery work. Still visibility was clear and observation was good. Along the Fourth Army front 171 hostile enemy batteries were recorded in action during the day. Many of these were engaged with counter battery fire. Explosions and fires were observed in Hardecourt, Longueval, Bazentin-le-Petit and Contalmaison. Enemy artillery retaliation was heavy but at no point severe. For six days now intense artillery activity and in all probability there are bad times in store for us. What the English are going to do, we do not know. Dear Wife, we are in a beastly hole. The English have been shooting day and night since Saturday 24th. They started at seven o’clock in the morning, simply terrible, along the whole front, not only at us... they sent gas over at us three times this morning, we have no rest day and night. Sleep is quite a secondary thing. As regards food, that is the same, we do not get anything except a little coffee... Yesterday evening my NCO and another man came back, they had missed their way. Yesterday, at night, they went off again to get some food and came back this morning at seven o’clock with some coffee. I managed to get a cup full and then the man who was carrying it fell down the dugout steps and we had to drink it there. Now we must wait again until tomorrow morning until we can get some more... They have been shooting for 144 hours now this morning and are continuing, let, us hope it will stop soon. It all looked encouraging for a XIII Corps successful attack the following morning, Z Day. By 2 am on 1 July 1916 all infantry battalions of the 30th and 18th Divisions were in their battle positions. The earlier hours of Z Day were described as relatively quiet. Now and again a ‘Verey’ light climbed skywards and with a ‘pop’ illuminated the immediate vicinity before dying away. Occasionally a gun or howitzer fired a salvo or a heavy shell whistled through the air en-route to a distant target. Machine-gun companies positioned high on Maricourt Ridge opened short bursts of rapid fire that arced through the sky, passing over the assembled and resting infantry with a distinctive ‘crack and thump’ before descending into the German positions. Out in No-Man’s-Land infantry patrols and battalion scouts ventured over to the other side, checked for German activity and then worked along the remnants of the enemy wire in order to check its destruction and to ensure no repairs had been attempted. Cover of the night also allowed the ten vanguard battalions of XIII Corps to finish cutting lanes through their own protective wire. In the rear area, gunners worked hard resupplying ammunition to the hundreds of guns and howitzers, stockpiling shells of all calibres next to the guns in readiness for the morning’s final bombardment. Underground, 183 Tunnelling Company, Z Section Special Brigade, trench mortar and machine-gun detachments covertly opened up apertures into No-Man’s-Land and prepared positions for Stokes mortars and Vickers machine-guns. Tunnellers connected and checked firing cables to plungers to be used to detonate explosive mines, bore-hole, push-pipe and manhole charges. Z Section finalised the assembly of two large gallery Livens flame projectors and cautiously dug to the surface at the head of their subterranean galleries. The sun would rise at 3.44 am, meaning all would be having some kind of a breakfast between 5 and 6 am. The morning would bring, what was for most, their first, and for many, their last battle. The Corps artillery kept up a constant barrage throughout the night as they had done every night for the whole phase of the preliminary bombardment. At first light the barrage increased slightly in intensity although it was impossible to see German trenches from the observation posts on the high ground due to thick mist. If the mist persisted, it would be impossible to correct and adjust the barrage as it lifted on completion of the bombardment at Zero Hour. The artillery plan called for the final intensive bombardment to commence at 6.25 am, or Zero Hour minus 65-minutes. Z Day also saw the use of an additional munition that had not been utilised during the previous week. From daybreak, attached French 75mm batteries of ‘Group de Comte’ fired salvos of gas shells into the German trench defences. Things started to get busy it sounded as though hell had been let loose every gun seemed to open up at once, I cannot possibly describe the noise the air was full of one continual hiss of shells flying through the air from all directions, it was impossible to hear one another talking, occasionally every few minutes a low rumbling noise would come through the air, some heavy shell from somewhere a long way off, it sounded as though it was tired and in a hurry to get to its destination and do its work, some souvenir for Les Allemands. 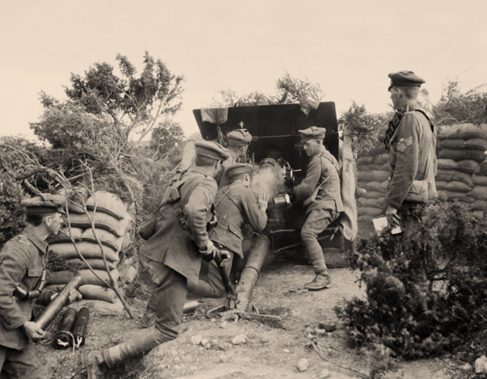 In total, fifteen 18-pounder batteries from 18th Division and thirteen 18-pounder batteries allocated to 30th Division, designated as wire cutting batteries, engaged the German first trench and, in several localities, the second trench. These groups included batteries attached from 9th (Scottish) Division, all firing on their designated 150-200-yard wide sectors. Each individual field gun was allotted 100-120 shrapnel rounds for the 65-minute bombardment. The remaining ten 18-pounder batteries situated north of the Peronne Road would go into action at Zero-Hour minus 15-minutes. Nine 4.5-inch howitzer batteries of divisional field artillery, three from each of the three divisions, were allocated targets that included main communication trenches and strongpoints. At Zero Hour minus 5-minutes they would switch to counter battery tasks. Each battery had prearranged known German battery locations to engage. Each battery had been allocated 300-rounds of SK gas filled shells to be fired at four rounds per minute for 20-minutes. 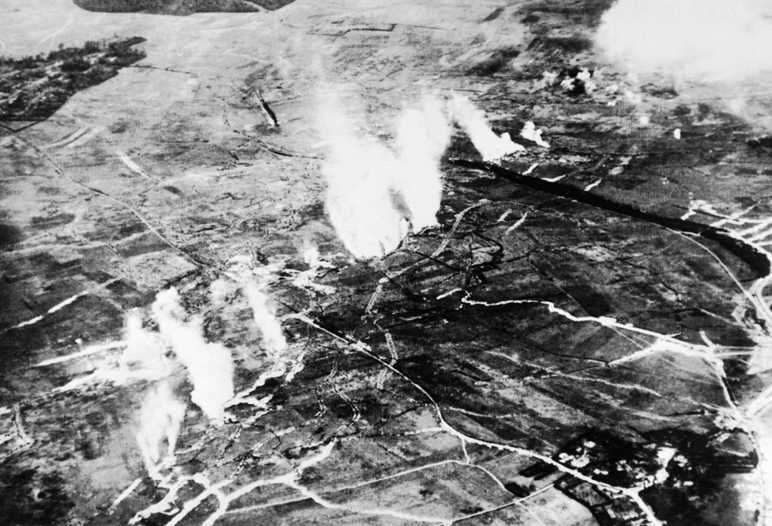 It was anticipated the gas would incapacitate the German gunners as they attempted to reply to the infantry assault. The field artillery would be supported by fourteen heavy batteries of the Corps heavy artillery groups; two (12-inch howitzers), four (9.2-inch howitzers), six (8-inch howitzers), twenty (6-inch howitzers) and sixteen French (220mm heavy mortars). Every individual howitzer or mortar had its own designated targets and corridor within the German first line system. As the 65-minute bombardment drew into its last quarter the ground mist began to disperse. At exactly 7.15 am, the forward 18-pounder batteries that had remained covertly hidden and camouflaged for the duration of the preliminary bombardment now showed themselves and came into action. The forward field guns fired on special tasks, including enfilading German trenches in the direct fire role. Some engaged targets as a complete battery on in-depth wire protecting strongpoints. These batteries would also be sufficiently far forward to support the infantry once the final objectives had been captured while the divisional batteries moved forward to positions that would bring them back into effective range. Several single 18-pounder guns had been covertly brought forward and dug into camouflaged emplacements. Two of them were positioned on the forward slopes either side of Minden Post, near the Albert – Peronne Road, and fired on a perfectly aligned enfilade shoot into and along ‘Black Alley’ Trench. Divisional 2-inch (medium) and 9.45-inch (heavy) mortars also took part in the 65-minute barrage. The 2-inch Stokes were tasked with destruction of German first and second trenches within their range (570-yards) and on specified targets such as known emplacements. At 7.20 am the rate of fire was increased for the final ten-minutes, gunners feeding the ammunition to their guns and howitzers to the maximum, loading and firing as soon as the breech was closed. Hundreds of shells smashed into the German positions, the ground vibrated and the air was filled with dust, smoke and the acrid smell of explosive. German artillery batteries were drenched with incapacitating gas and then rained on with 60-Pounder shrapnel. At 7.22 am the Stokes 3-inch mortar batteries were also committed to the fight. Spaced along the Corps frontage, up to forty individual mortars fired at once, putting down an 8-minute hurricane bombardment on the German first trench. 30th Division launched their Stokes barrage from four Russian Saps. 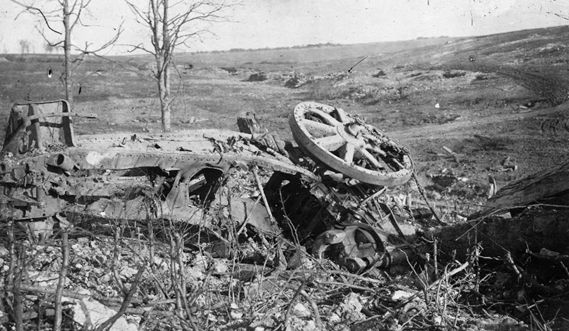 Within eight minutes up to 2,400 bombs crashed into the German first line system. 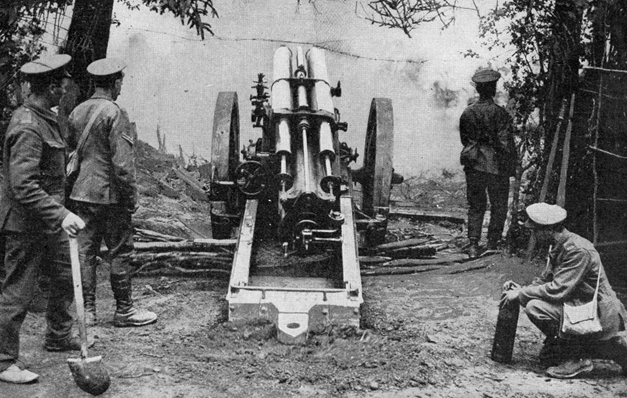 The 18th Division’s 3-inch Stokes mortar batteries deployed a total of twenty-four mortars from their first trench. The orders came down: ‘Half an hour to go.’ ‘Quarter of an hour to go.’ ‘Ten minutes to go.’ ‘Three minutes to go.’ I lit a cigarette and up the ladder I went. The contents of Zero Hour Z Day website are copyright © Jonathan Porter unless otherwise stated. No part of this website may be reproduced in any form or linked to any other website without permission of Jonathan Porter. Photographs captioned with ©IWM are copyright held by the Imperial War Museum and may not be reproduced without the permission of the Imperial War Museum.